The Eyepiece is designed to seal out stray light for improved viewfinder optics. 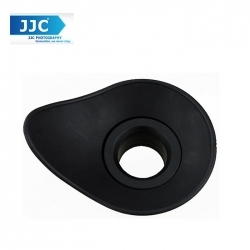 Made of soft TPU rubber, it protects your eyes from scratches, especially for eyeglass users. The eyepiece adopts an ergonomic oval shape to fit your eyes better. Besides, the eyepiece is 360º rotatable, so you can adjust it for horizontal or vertical view. Canon EOS 6D, EOS 60Da, EOS 70D, EOS 80D, EOS 100D / Rebel SL1, EOS 550D / Rebel T2i / Kiss X4, EOS 600D / Rebel T3i / Kiss X5, EOS 650D / Rebel T4i / Kiss X6i, EOS 700D / Rebel T5i / Kiss X7i, EOS 750D / Rebel T6i / Kiss X8i, EOS 760D / Rebel T6s / 8000D, EOS 1100D / Rebel T3 / Kiss X50, EOS 1200D / Rebel T5 / Kiss X70, EOS 1300D / Rebel T6, etc.